Let’s face it! Motherhood is a challenge; one that, regardless of the struggles, we would not trade for the world. The beauty of it all is the joy that comes when you are privileged enough to share your love, experiences, and wisdom with the young lady that will someday live the path you both have cultivated and prepared her for. Once that sweet little baby girl that you dressed in pink back some time ago is now the strong willed, independent young lady who seems to oppose your every suggestion. As the years pass and the days tell the story, you come to realize that your baby girl is or has grown up. What’s results from here is not always something that you can control as your little lady will take her own path. The most important thing to remember is this….if you build the strong foundation, she will not only always remember where home is in her heart, but she will carry the lessons that you have taught her deep within and will use them as her life unfolds. Mothering daughters takes an unbelievable amount of strength as you must work to teach her competence, confident, and tenacity amidst the competitive and sometimes cold world. You must model self respect and self love even when you feel empty inside. You must show her how valuable she is regardless of financial status, academic standing, or social relationships. Draw her attention inward to truly understand how authentic beauty is formed and displayed to the world. You see, mothering daughters is more than just teaching a young lady the ropes of survival. It is more than guiding her in good decision making and staying close when she is hurt. Mothering daughters is about you. Your walk, your talk, and the way that you present yourself to the world will impact your daughters life far beyond what you can see. Innately she learns to watch you, to listen to you, to pattern her life around the thing that you teach her and how you choose to live. This example will be present throughout her life. So as you mother your daughter, you must first understand where it all begins and seek ways to be a better you. It’s never too late! A beautiful young lady is watching. Life teaches us that we must take charge of the things happen around us. Once we grow and mature, we must no longer take the easy way out of blaming others for our conditions, circumstances, failures and every other negative situation that is apparent in our lives. While our surroundings may play a part or be a contributing factor, we are ultimately responsible for our own life outcomes. Life teaches us to speak up for what we desire and how we want our lives to take shape. We must not waste time seeking to change people around us because that is far beyond our reach and out of our control. We must embrace the power within us to change things around us so that we are living out a life that is true to who we are. As that life begins to take shape, we will draw those people and things that will support and enhance our desired life. Life teaches us that while change is good, it is often one of the most difficult aspects of life to maneuver. As you look at your life and all of its baggage, good and bad; take purposeful steps to live in sync with your purpose. But remember that not everyone around you is where you are. You must exercise patience and compassion as you move throughout each day. Start to pattern your life according to your life goals and remember that your behavior, character, walk, and talk will be the deciding factor of whether or not the people around you will change. Life teaches us that the people around us are not perfect and neither are we. We have a responsibility to live a life worthy of our life’s purpose. This includes being a conduit of love in all areas of our lives; with the absence of criticism and judgement. As we live out our lives, we will see the results we are looking for when we extend ourselves beyond who we have been. Life teaches us that we certainly deserve to live the life that we desire but it also teaches us to be compassionate and understanding as we walk in the light through love. As you seek to embrace all that life has taught you, remember, the lessons are ongoing and when you feel that you have arrived, you are just beginning. Allow life to continue to teach you to live a life full of love for others, for that is what life is all about. The beauty in every new day is that the opportunity for you to live intentionally is still present. Regardless of every struggle, setback, obstacle, or pain, you have been given the light of day to seek to see clearly how you should live out your life on purpose. Before the start of each day, commit to spending time in quiet meditation to focus your mind on the most important tasks of the day. Seek to prioritize so that you will eliminate the possibility of stress and frustration. Bring order to the chaos that often erupts when you fail to plan. Walk throughout your day with a spirit of gratitude not underestimating the blessing that you have been given to live, to move, and to breathe in this day. Set out to be excellent in every word that you speak, every step that you take, and every action that you participate in. Be an example of how to embrace the beauty in every new day! Have you ever thought that you had something wonderful to share with the world but didn’t know how to do it? Have you had life experiences that mirror that of other people just like you? It has been a tradition in some families to keep family business in the family. While this is understandable and even a necessity for many circumstances, it is easy to conclude in our minds that everything mist remain under the secret umbrella. But when we work to keep our story under wraps we miss the opportunity to help someone else. Sharing our story is not about airing dirty laundry or exposing family secrets. Nor is it about putting your business out there for the purpose of gaining recognition, accolades or sympathy. But instead, telling your story is about sharing who you are , where you have been and where you are going in hopes of helping someone else along their journey. Subsequently, you may find healing even within your own story. This will open the door to allowing you to see life from a new perspective. What do you hope to accomplish by telling your story? What family member(s) or friends should you have a conversation with before telling your story? What avenue/platform will you use to get your story out there? What resources will you need to fulfill this project? What reservations do you have about sharing your story? Ready to tell your story but don’t know where to start? Looking for additional support in moving into the next level of greatness in your life? Determine the areas that are most in need of a makeover and get to work! What (or who) do you need to get rid of? In what area of your life do you need more organization and order? in what area has your focus taken a back seat? What area do you need more or less of? Don’t try to change everything all at once. A life makeover takes time and careful thought. Give yourself permission to slow down and think about how you can live a more fulfilling life. To begin your personal growth, you must know where you are in each of these areas. If you are continuing on your journey of personal growth, it is always good to re-evaluate where you are and determine your roadblocks to successful functioning in these areas. Decide on one specific area that you would like to focus on. There the process begins! I used to write when I was a teenager. It was how I learned to maneuver my way through the twist and turns of adolescence as well as an outlet from academics, peer pressures, failures, self defeat and other childhood and young adult issues. It was my refuge, my safe place to express my thoughts and emotions about any and every thing that I faced. It was the light that brightened up a dark day and the joy that took the place of the sorrow from disappointment. It was the smile after a successful moment and the promise of peace before ending an event filled day. After many years of writing, I didn’t really grasp the possibilities until I become a college student. It was in those moments rhat a creative writing class became more than just a requirement for graduation but a training ground for me to hone in on my gifts, enhance my skills, and embrace the freedom of expression that was there for me to partake in. Many years passed as I read the work of other authors while at the same time writing plays, fiction stories, short stories. and poems all inspiring and awakening the natural gifts within me. Filling up the memory of floppy disc drives, desktop computers. laptop computers, jump drives, and external hard drives, I stored it all away. I was oblivious to the possibilities. Regardless of the talent that I had been blessed with, I chose to keep it hidden, thinking it was really something to keep to myself for myself. It was not until someone very dear to me said “You have so many poems. Why don’t you put them in a book?” My excuses meant nothing as I was then told, “I want to see you write a book.” I could not let her down but I had to get to a moment in my life when I could decide to let go of all of the anxieties about putting myself out there and just do it . Little did I know that making such a decision would change the course of my life, allowing me the opportunity to live the life that I have always desired. Empowering people through my work and my gifts touches a part of my spirit that I had kept hidden for so long. 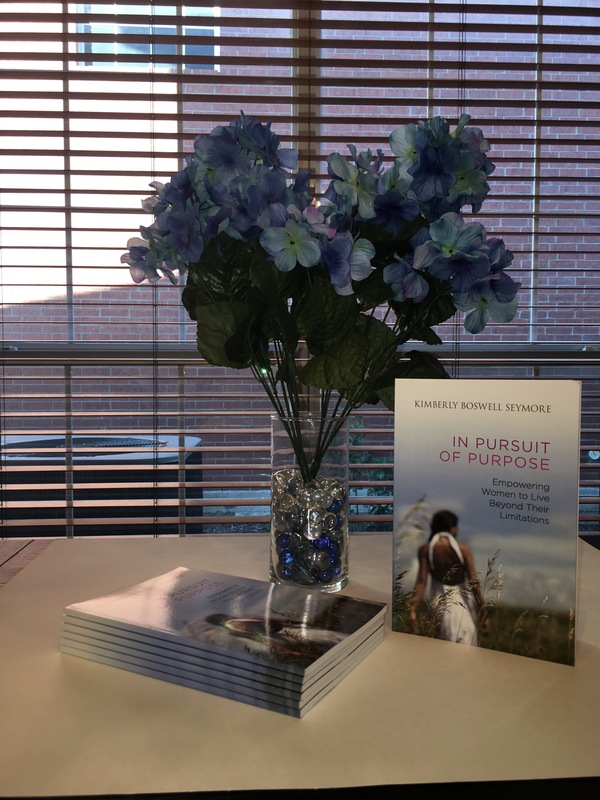 “In Pursuit of Purpose, Empowering Women to Live Beyond Their Limitations” is just that, an example of how I moved past my limitations. using my gifts to pursue my purpose. I had come to realize that instead of sharing my gift with the world, I had chosen to keep it hidden. Fear of failure, ridicule, and lack of acceptance were subconscious emotions that took root. Writing this book gave me permission to be free; free to think, feel, act, believe, dream and to be exactly who I am. I now realize how I was limiting myself. In just a short period of time my willingness to use my gifts has broadened by perspective and placed me on a higher playing field than I had thought possible. If you have a gift, use it. Figure out a way to walk in it every day. Someone is waiting on you. There is something that will not get accomplished if you don’t get involved. It is amazing who or what you can impact through your gifts. When you operate in your gifts, not only will you get confirmation but you will experience a new level of blessings in your own life. Don’t worry about judgment, fear, or failure. There will always be naysayers, but what do you say? What does your spirit say? What do you hear when you get up from your knees after praying? What do your feel about your life purpose in those quiet moments of reflection? Don’t waste any more time. Get to the business of doing what you are supposed to do and do it with all that is within you. That is the recipe for success!